Take 1 level teaspoon (4 grams) as needed for symptom relief, dissolved in liquid or sprinkled on food. Adults and adolescents may take 3-6 level teaspoons/day. Children age 9 or younger may take 2-4 level teaspoons/day. Higher doses may be used as recommended by a physician. 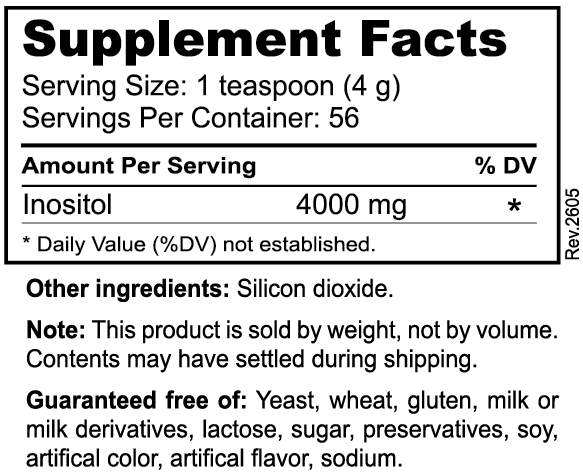 A bottle of Inositol Powder contains 56 servings. For information on how Inositol Powder is used in conjunction with Daily Essential Nutrients, see Treatment Guidelines in the Daily Essential Nutrients Clinical Reference for Healthcare Professionals.